Two weeks ago, on the 1st April, we ran our marathon giving day, sponsoring 150 people £10 each for their marathon efforts towards good causes they care about. We did the same last year, but I wasn’t at the company then, and I’ve got to say that I found it an unexpectedly inspiring, encouraging, sobering and moving experience. Now that the dust settled on all the giving and emotion (!) I wanted to share some of the incredible stories I heard, and how it impacted me. We heard from a real variety of people. We had people running their 15th (ish) marathon (Gower Tan and Carol Littler) and a whole raft of people running their first ever - including plenty in their 40s and 50s, proving that it’s never too late to start. Like many of us, I live a busy life, and can fall prey to that incredible human skill of finding an excuse not to do something that feels too hard! It might sound cliche, but seeing these people, who are older than me, get going and do something towards ‘their cause’ really empowered me to get on with it for myself. And that wasn’t all. As if ‘just getting started’ weren’t a good enough excuse, any idea that the circumstances of my rather comfortable life could get in the way were quickly obliterated too. We had Melanie Barratt, who is blind and is actually a paralympic gold medallist in swimming, but who has now signed up to run a marathon with a sighted guide. Wiki Solly is partially sighted and running her first ever marathon, also alongside a guide. Nicole Glover has lost 7 stone to run, while another runner has lost half his body weight (!!!) to get in shape for the marathon. Susie Godley is running for MS, while living with MS herself. All truly incredible and awe-inspiring. The final real encouragement to me came from people who have been through awful circumstances, where it must have been hard to see any sort of route forward, to come to this point of running a marathon. It was a reminder that however hard life can be (and let’s face it some of us have to face up to really hard stuff), that much of the time, the light of the tunnel will emerge, and the story will go on. Claire Flatt is raising money for McMillan (and is nearly at an astonishing £10,000 - nice one Claire!) and has gone from chemotherapy to running a marathon in 9 months. Claudia Burrough, another sponsoree, will be completing this year’s marathon in a wheelchair after losing her ability to walk in the training period for last year’s marathon. Nick Smith is running for Spinal Research after having his back replaced 12 years ago following an accident. We really did read everyone’s posts and contributions and there were so many more we could have mentioned. Like Minal Patel’s inspiring response to incredible loss and adversity which had us in floods of tears or Debbie Ward closing in on raising an incredible £100,000 for cancer research. We don’t have the space to share all 150 stories here, but you can head to our Facebook post to browse them for yourself. The big take away for me was that while there are so many amazing causes to support out there, a huge part of making a difference is simply taking the energy and effort to show up and do something. It can be easy to block these causes out, or simply get busy with everyday life (and there’s no shame in that) but actually by going out of their way, these amazing and inspiring yet just-like-me people are really contributing to causes that matter, and raising awareness at the same time. It was a privilege to be part of it, and as a company it felt like a real honour to play a very small part in these stories. Going away at the end of the day I had a smile on my face at this beautiful but unorthodox way of giving (we even had to pause at one point for a bank fraud check! ), at the incredible stories efforts of these wonderful people, but also with a real sense of challenge. What can I contribute? How can I open myself up to others stories and experiences enough to provoke me to action? It looks different for all of us, and I don’t foresee myself running a marathon soon (although maybe you do!) but it has certainly given me a different insight and outlook, and empowered me to believe that I can, and must, do my own small bit towards making this world of ours a better and happier place. Good luck to all you amazing runners doing exactly that! I am a games maker. I am a founder. I am a mother. And I guess I am an ‘entrepreneur’. Why is it that this last one still feels funny to say? Maybe because I never expected to be here. I didn’t set out to become an entrepreneur. When I was at school, I never even considered the idea. And I’m sure the careers adviser never suggested it. Wrongly or rightly, the stereotypical view of an entrepreneur I’d absorbed from society was of the ruthlessly ambitious workaholic, sacrificing their family and personal life to focus on selling and negotiating around the clock, in order to dominate in the harsh dog-eat-dog world of business. This persona didn’t feel relevant or appealing to me at all. So how did I end up here? The idea of setting up a business to get my game, Randomise, out into the world came about more as a necessity than a lifelong dream. I was stuck in a job that was sucking the life out of me and I wanted to find a different way to put some good out into the world. When I quit my job and founded Gamely Games, I was fully expecting to be thrown into the stressful, lonely, all-consuming struggle I’d imagined awaited all ‘entrepreneurs’. But my experience of setting up a business couldn’t have been more different. What I discovered was a huge network of support and advice, and a community of new entrepreneurs creating businesses with purpose and balance. People doing business differently, starting with what is good and meaningful and growing their companies in a way that made their lives better every day. Initiatives like the Happy Startup School, Entrepreneurial Spark and the Kings20 accelerator scheme at King’s College London (just named the UK’s most Outstanding Entrepreneurial University) have given me invaluable support and guidance, and these communities make starting and growing a business much less daunting and far more enjoyable. I found that platforms like Kickstarter go a long way towards levelling the playing field for aspiring creators. And, crucially, I discovered outsourcing services that make running a business a really viable option for people who can’t, or don’t want to, work 80 hours a week. 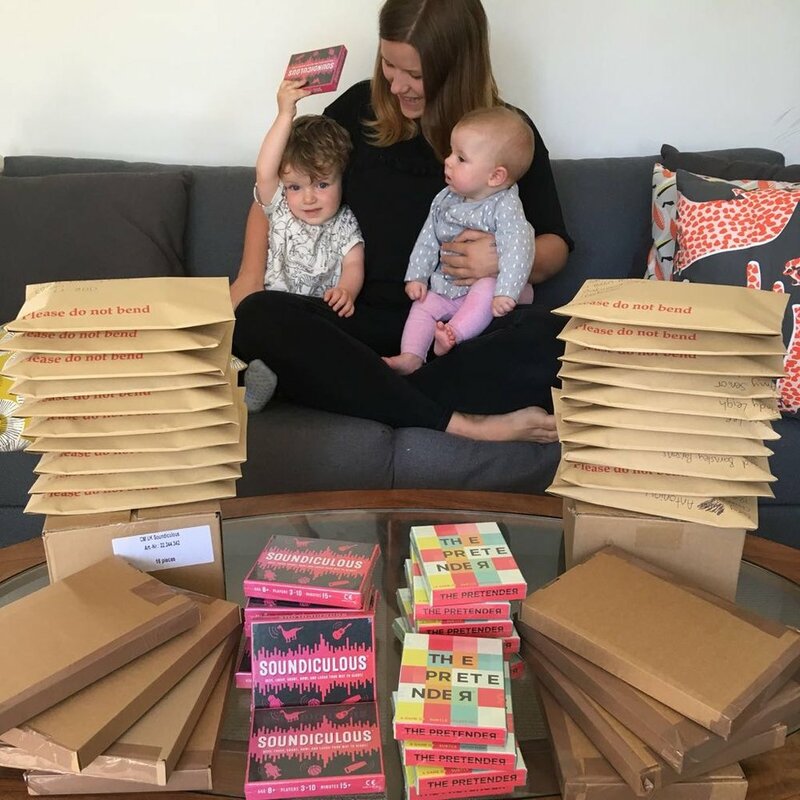 For example, thanks to the Fulfilment by Amazon service (who pick and pack all of our Amazon orders) I was able to work an average of just half an hour a day after the birth of my first child and turn over more than £100k in the first six months of his life. I discovered that it was possible to run a thriving business that fits flexibly around your other priorities. Who else is missing out? I’m not saying that starting a business is easy by any stretch. I know that each entrepreneur will face their own set of unique challenges and will make their own compromises. I am also very aware of my own privilege and the many advantages I have benefited from, simply by being born into a white, middle class family in the UK. But why was my perception of entrepreneurs so different to the new reality? Why did I have no idea that entrepreneurship could be an option for me? And who else is missing out on these opportunities because they don’t see people they identify with running businesses? These are questions I don’t have the answers to. I know I’d love to play a part in changing the face of entrepreneurship and raising the profile of successful startup leaders who don’t fit classic stereotypes. But what this looks like in practice/action I’m still working out. I have read that 70,000 people across Britain would like to start up their own businesses but haven’t done so. 28% feel that the process is too complex, and 36% don’t have enough confidence in themselves to go it alone. I want those people to know that it is possible, and that there are many different routes to success. Tomorrow I’m going to raise my questions at Number 10 Downing Street. Through Kings20 I’ve been invited, along with 10 other entrepreneurs (including the incredible Tobi Oredein of Black Ballad and Ismail Jeilani of Scoodle), to a round table discussion with Jimmy McLoughlin, the Prime Minister’s Special Adviser on business. We’ll be asking what the government could do to promote entrepreneurship to a wider audience. This isn’t just good for society, it’s good for business and the economy. My little company Gamely Games now employs several people and has turned over half a million pounds. If we can show more people the flexibility and empowerment that entrepreneurship can offer, imagine what value that could bring - to their lives and to the economy. I’ve no idea what will come from this meeting at No.10, but I want to be part of the conversation.